As a local Silverdale moving company, Gigantic’s Silverdale Movers offers fast and easy full service for your residential move. Establish yourself among the 20,000 residents in Silverdale, and see why this waterfront city is a quaint gem of the Pacific Northwest. Gigantic’s Silverdale Movers understand that relocation can be stressful, so we use knowledgeable professionals to ensure the safety of your items. You can leave the packing, loading and transporting to us while you take a look at your new surroundings. 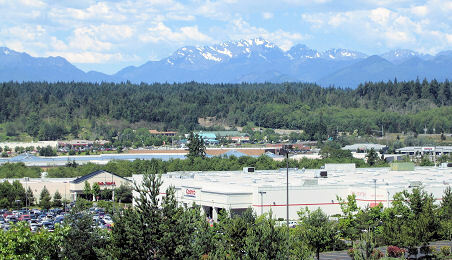 Based at the north edge of the Dyes Inlet, Silverdale has a strong water community filled with activities and events. It’s also a neighbor to Bremerton, which features Washington State Ferry Terminals to get you out and around the big cities. A more serene lifestyle awaits you when moving to Silverdale, the small town is quiet and calm giving you a chance to work on old hobbies or projects. With an economy strong in retail, there are plenty of shops both big and independent for you to take a look at. Bring your favorite lamps and sofa with Gigantic Moveres and then spruce it up with art or lamps from one of the local shops! Get to know your new city a bit better at the Clear Creek Interpretive Center. Great for kids and families or just the curious, the center holds nature classes and an art contest. There are plenty community activities like the Haunted Fairground, Jingle Fest Holiday Craft & Gift Show and more to enjoy, and for more mature interests, there’s a casino nearby as well. Silverdale sits nearby many great wineries and vineyards as well, so the connoisseur can have a good time both in the local restaurants or out in the fields. Your local movers at Gigantic’s Silverdale Movers will leave the while exploration up to you as we head down the road to your new home. Our reliable service will have you smiling from start to finish. Give yourself some time to get nestled in after the move, but once you’re ready to take in the sights, don’t pass up the theatres around the area for great music and other performance. Silverdale is a great jumping off point for the beautiful Kitsap Peninsula. Read more at Silverdale Gov.